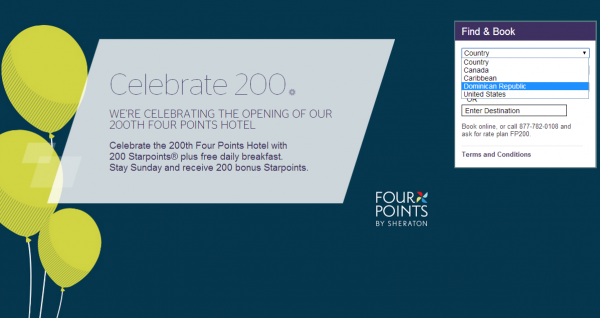 Starwood is celebrating the launch of 200th Four Points hotel and is offering a breakfast inclusive rate plan with 200 bonus Starpoints + extra 200 for Sunday nights (400). This offer is valid for stays between August 1 and December 31, 2014, in the United States, Canada, Caribbean and Dominican Republic. Note that you can earn 200 bonus Starpoints PER stay and not PER night. You will earn 200 bonus Starpoints for staying over Sunday night. Seems that the bonus points + breakfast rate is tied to the best flexible rate and there are often lower rates available as well. You should book this offer when there are no other discount rates available (or someone else is picking up your bill).